New bike, new year and here I am training for the Furnace Creek 508 again. For those that are not familiar with the Furnace Creek 508– it is a 508 mile non-stop bike race with 35,000 feet of climbing. Along the way you pass through the Mojave and Death Valley deserts and summit ten mountain passes. It is “the toughest 48 hours in sport” . I am returning for a sixth SOLO run. To my knowledge, I am one of only two racers to have successfully completed five consecutive solos. The other racer is Michael Emde, multi-time Furnace Creek 508 Champion. Yesterday, I had a few errands to run before being able to ride. 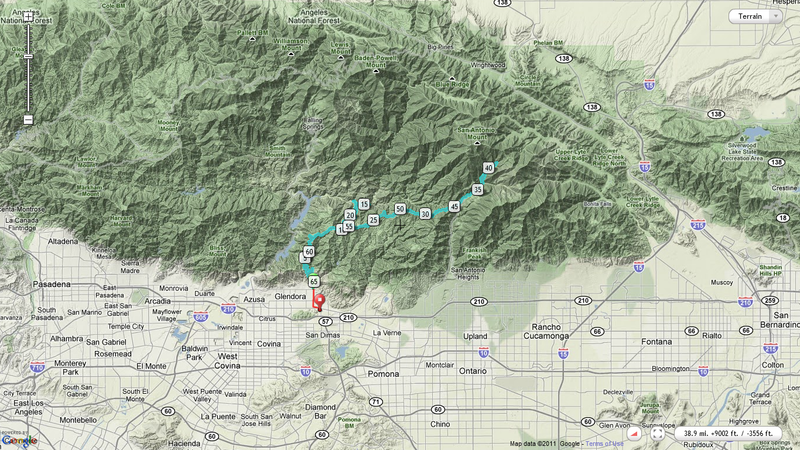 I began my ride out of Glendora later than I ever have. It was 5pm. But I thought it would be interesting to do the majority of the ride in daylight and finish the ride with a little night riding. I was prepared with lights and set off. 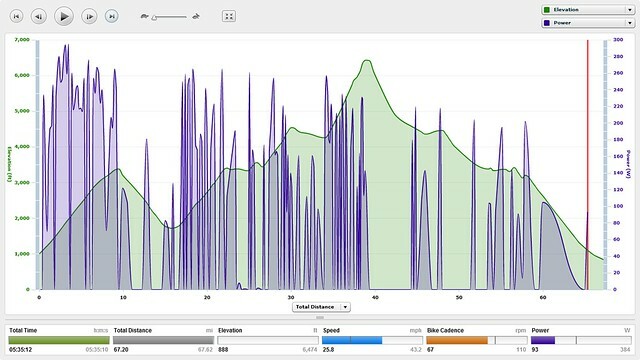 About 8,500 feet of climbing in 39 miles! Elevation chart for my ride. 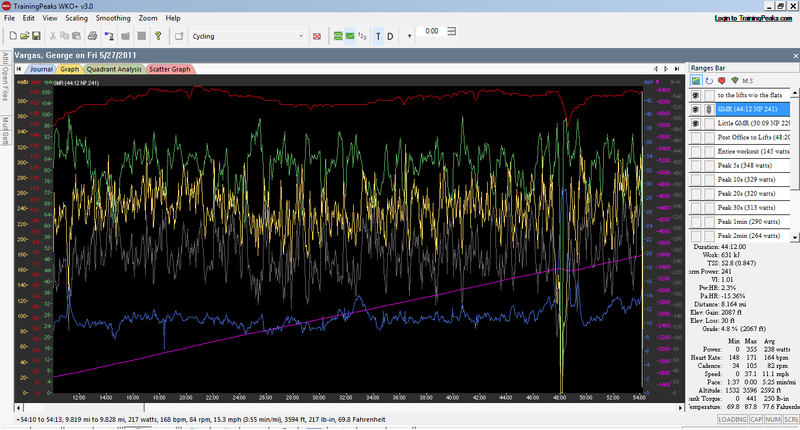 It is early in my preparation for the Furnace Creek 508 but I wanted to see what my form was like. 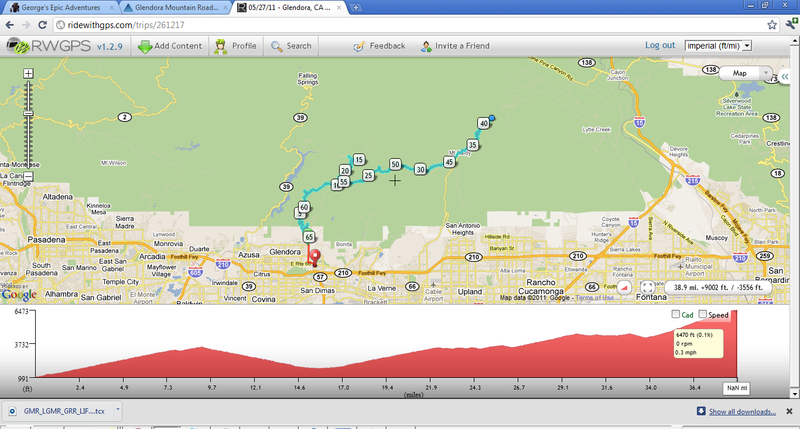 I set out on Glendora Mountain Road with a short warm-up and then went for my Personal Record (PR) of 44 minutes. I felt fine during the climb. 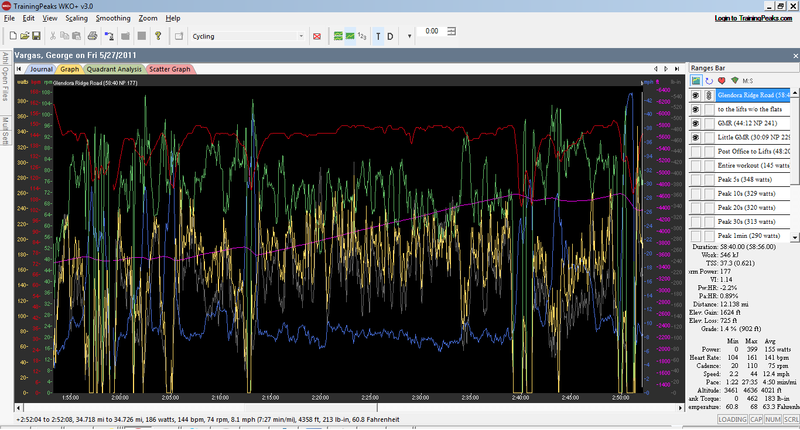 I looked at my power numbers compared to my heart rate and once again I noticed they were lower than usual. I have been participating in CVAC sessions and I believe that has a lot to do with it. More on CVAC later. I was only 12 seconds off my PR. 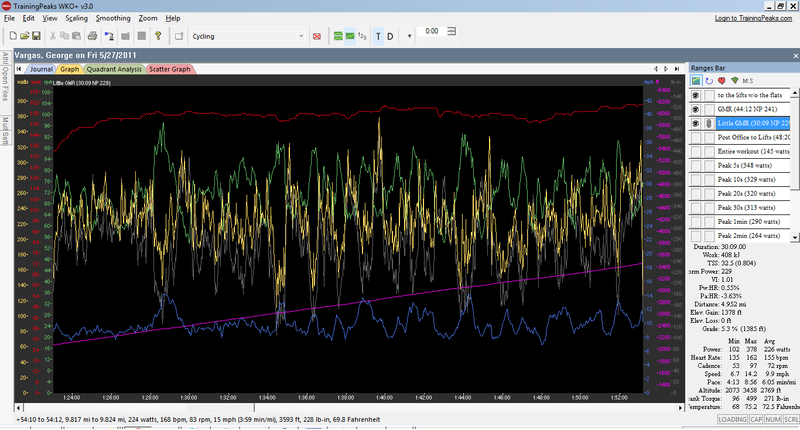 The result is very promising since it is only May and my PR was set in late August when I am in much better form. the other reason my result is good is that it comes at the end of eight workout training week and almost 19 hours on the bike. 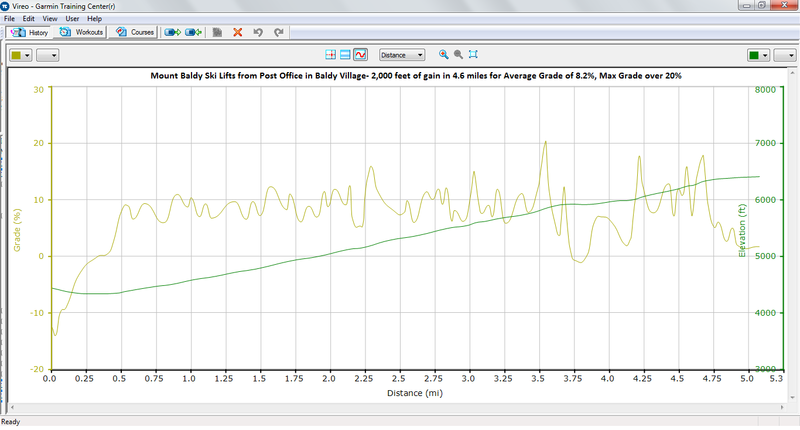 Below is the graph of my ascent of Glendora Mountain Road. Once I crested GMR I descended towards Camp Williams. That descent is a favorite of mine but there were too many rocks strewn on the road to really enjoy it. The weather was perfect. I hadn’t finished my first bottle when I pulled into the Camp Williams store. I topped of the bottle and then ascended what I call little GMR. Why? Because it is only 4.9 miles vice 8 miles — seems like a good enough reason to me 😉 My time was 30:09 from the right turn onto GMR to the junction at with Glendora Ridge Road. It was slower than my PR but I was spent from going hard on GMR. 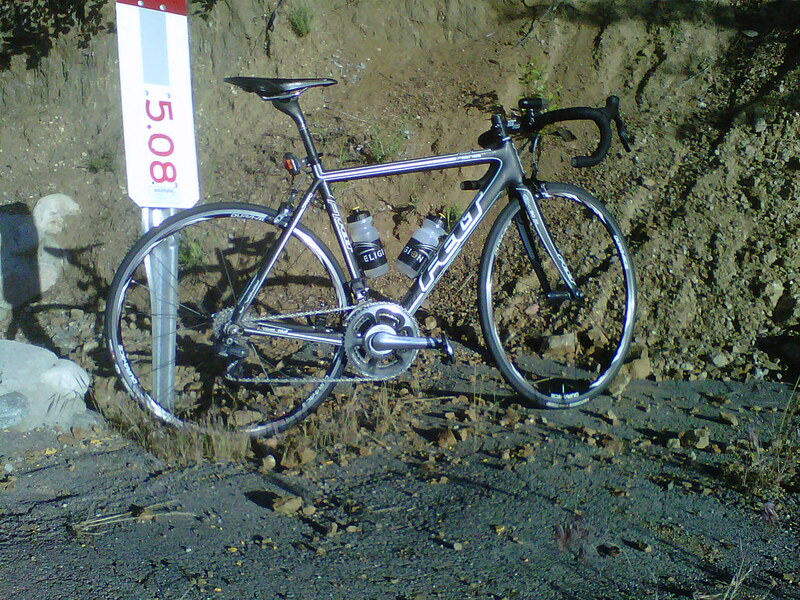 Once at the junction I continued climbing on Glendora Ridge Road. I was not going for any specific time other than just keeping the intensity at medium level. I was fatigued but recovered on the occasional downgrade. It was now night time 8:45 pm. And this is where the “adventure” in George’s Epic Adventures begins. My headlight was shutting off every time I hit a bump. So I pulled over to see if the battery was fully engaged and that’s when I noticed the plastic enclosure around the proprietary battery had broken. When I tried to reinsert the battery it wouldn’t work at all now. Hmm…I already dislike proprietary stuff but now I’m at the top of Mount Baldy …pitch black with no ambient light…and 26 miles from my car on almost all twisty downhill! Now I could abandon the light and get my night vision which would take about 20 minutes. I could see the road in general and use the fog line and the centerline to guide myself down the mountain. But my main concern was all the rocks I had seen strewn along the road– just hitting one of them could ruin my season if not more. And then there was the x-factor. Something I hadn’t considered was the boy racers in their fast cars racing up and down Glendora Mountain Road. One very scary moment three cars came around a blind corner over the centerline right at me. I swerved to the ditch and was safe but I think I gave that young man a good scare as well. He was probably thinking what is this crazy dude doing on a bike at 10 something at night with no headlight descending this mountain. 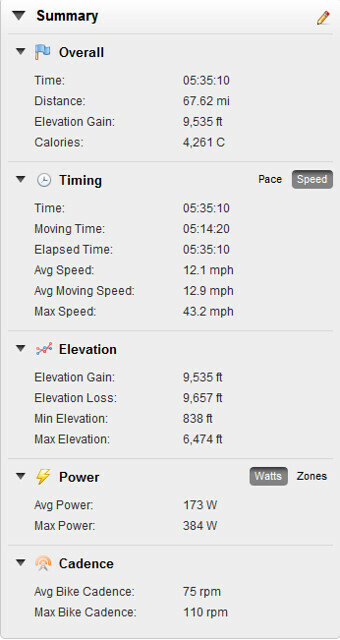 The last 26 mile stretch took me 1 hour 40 minutes and my average speed was only 16.5 mph. Actually, that isn’t so bad afterall. I was cold as well and I was never so happy to see my car. 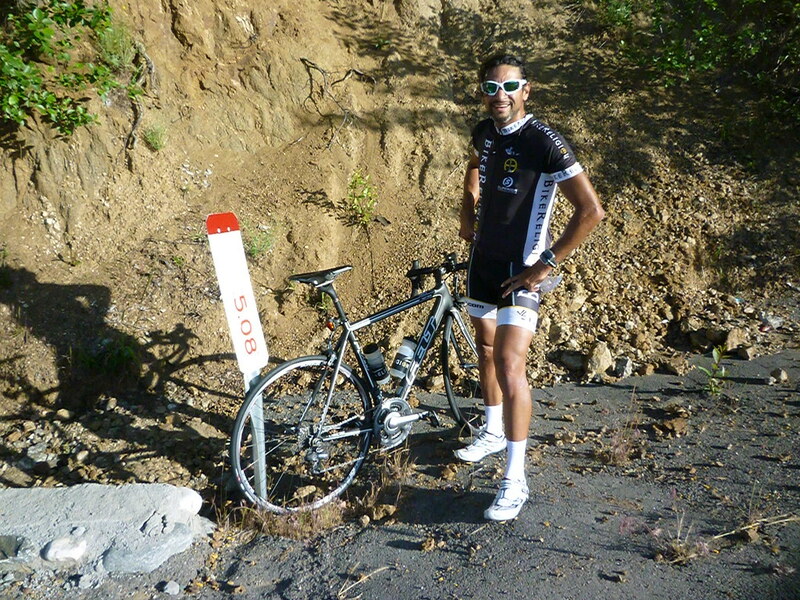 George “Red-Eyed Vireo” Vargas on Felony – his 2011 Felt F1 with Shimano Di2 and SRM 7900 power meter climbing Glendora Mountain Road. And now for a special treat I met Ray Clone as I was taking a picture of Felony in front of the 5.08 mile marker sign. He explained to me that he has been riding Glendora Ridge Road for 30 years. He asked to take a picture of me…how could I refuse? 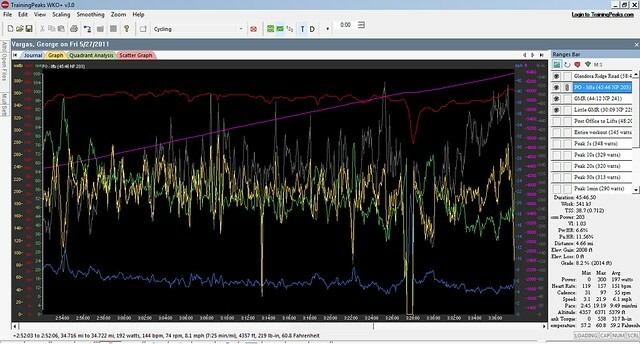 This entry was posted in CVAC Sessions, Glendora Mountain Road by REV Cycling Directeur Sportif. Bookmark the permalink. There was a rider that flew past me on GMR obout the 8% ascent on the way to the shed. Wondering if that was you? Ray Clone is an awesome dude. Hope he helped you out with the battery/light. Excellent ride report as usual. I am truly in awe at what you get done. Amazing to say the least. Not sure what lighting system you’re using but I’ve had some really good results with the Magicshine 900. It’s not really 900 lumens but it’s one of the brightest lights out there and middle setting has lasted me 6 hours and it’s less then 100 bucks delivered. I’ve had the misfortune of going down GRR/GMR in the dark but had a decent moon to help me out plus temps were on the warm side.Great job getting down in one piece. I heard a lot of scary stuff in the bushes that I really didn’t want to know what was causing the noice. What do you mean by “I am truly in awe at what you get done. Amazing to say the least” ? I use a good light now and was sponsored by Niterider for years. it’s partially my fault since I dropped the battery and cracked the enclosure. I use the Serfas True 250. They are coming out with a 500 lumen by summer.